All the while, crescendoing music in the background. We all have experienced movie trailers. Their purpose: to lure you in. The trailer and the producers give you enough details to know what the basic premise is but yet leave you wanting more information. While the idea of teasers is not unique to the movies, they can be incredibly effective. And it is the concept of a teaser that is the inspiration of the 5 Minute University (5MU) project. Teachers, instructors, and faculty have busy schedules yet also want to be more effective, particularly educating their students. As such, instructor development is an essential element both in K-12 and continuously up through higher education. But with busy schedules, who has time to read a book about teaching and learning, keep up with the literature or spend an hour to a day at faculty development workshops? But they may have 5 minutes. 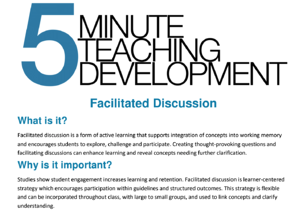 These 5 minutes may be during the work day, at home or even taking 5 minutes out of a scheduled meeting or workshop to talk about teaching and learning. 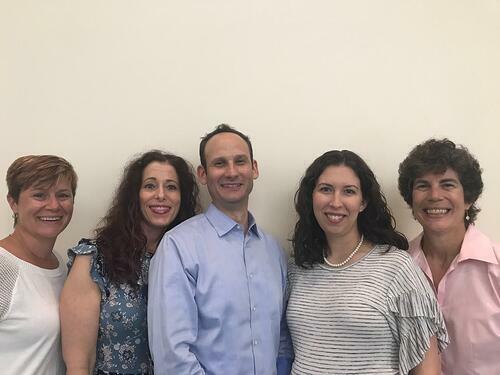 Faculty co-investigators developed a series of 5MU videos about various topics related to teaching, learning, precepting and general faculty life. 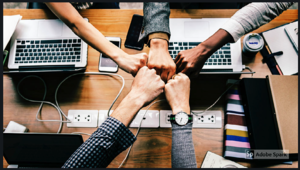 These videos present one topic and consist of a general overview, condensed information to get people started, and a handout for them to continue their learning and individual development. Our goal: to improve educational practices 5 minutes at a time. This project was started as a collaboration between the schools or colleges of pharmacy, health sciences, and medicine at the University of North Carolina at Chapel Hill, Northeastern University, the University of Arkansas Medical System, Palm Beach Atlantic University and Pacific University. The initial target audience was pharmacy and health profession education. But it grew. It expanded to address the needs of everyone who touches a student’s life. It was moved online via a course design utilizing SoftChalk with a faculty collaborator at Winona University. And it continues to grow. First, it was just schools of pharmacy enrolling…then other schools and colleges within Universities. Now dozens of departments, schools, colleagues and Universities disciplines subscribe to this open-access resource research study on the impact of the 5MU. So what does one of these 5 minutes university videos look like? They start with learning objectives. They provide an overview to the topic and some How-Tos. All in under 5 minutes. Let us take the topic, “How to get students to prepare before class”. An important topic, especially if faculty are trying to flip their class. In order to get at deeper understanding or higher levels of learning, the more knowledge and skills the students enter class with, the more they will get out. So student preparation is important. The video goes through 5 key elements of RAISE. The R, have a reason. Ideally, if students come prepared, class time is used for application or further learning. It should not be a duplicate lecture. The S is for student friendly. Textbooks are written by experts for experts—at least in higher education. Students will get lost in the jargon and stop reading. How can we generate material that meets the student at their current level so we can raise them up? This may be instructor developed reading material or a short video. The final letter in RAISE is E. E for efficient. We are all crunched for time. How can we get students to prepare for class as efficiently as possible? Let us say for every hour in class, students has 45 minutes to 1 hour to prepare for that class. What can they do in that time? A 20 page chapter is too much as is a 1 hour video. Because students have to read or watch a video and then study it for the quiz you may give them. So being mindful of time is really very important. 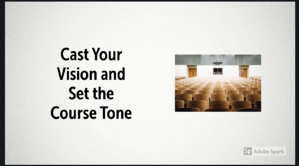 In under 5 minutes you get a better understanding of how to get students to prepare, or how to do a think-pair-share, give feedback, design better PowerPoint slides, how to analyze exam metrics and so on. 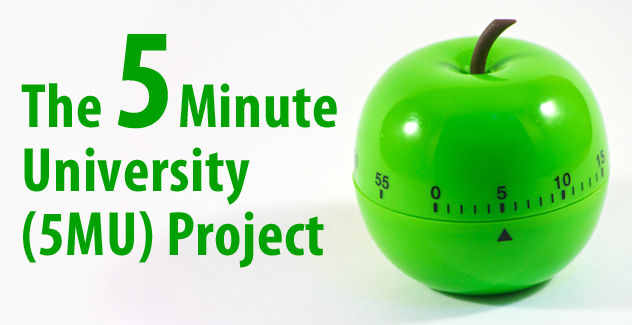 This is the 5 Minute University. Have 5 minutes to take a look? Ashley N. Castleberry, PharmD, MAEd is anAssociate Professor at the University of Texas at Austin College of Pharmacy. She has collaborated on over 20 published works including peer-reviewed journal articles and book chapters, over 40 podium presentations, and over 30 abstract/posters. Seena L. Haines, PharmD., BCACP, FASHP, FCCP, F-NAP, FAPhA, BC-ADM, CDE., is the Department Chair for Pharmacy Practice at the University of Mississippi School of Pharmacy. Seena has collaborated on over 40 publications, 20 abstract/posters, 7 book chapters, 13 competitive grants, over 100 International/National podium presentations and has served in over 30 elected offices in National pharmacy organizations. Susan M. Stein, DHEd, MS, RPh, is Professor Emeritus at Pacific University School of Pharmacy and the Managing Member of Susan M. Stein Consulting, LLC. She served as Associate Dean, College of Health Professions, Director of PIPER, and Dean of the School of Pharmacy at Pacific University. She has presented and published in the areas of faculty teaching development, leadership and management training, and academic mentoring. Jenny A. Van Amburgh, PharmD, FAPhA, BCACP, CDE is a Clinical Professor and Assistant Dean for Academic Affairs at Bouve College of Health Sciences - School of Pharmacy, Northeastern University. She has collaborated on more than 20 published peer-reviewed articles in pharmacy education and ambulatory care practice. Adam Persky, Ph.D., is faculty at the University of North Carolina at Chapel Hill. He has collaborated on over 50 published works, including book chapters, educational research, and commentaries. He has given over 100 national or international talks about teaching and learning.